and have no energy for anything. These are days I feel so empty and disconnected from the world, I will do anything to hide from it. 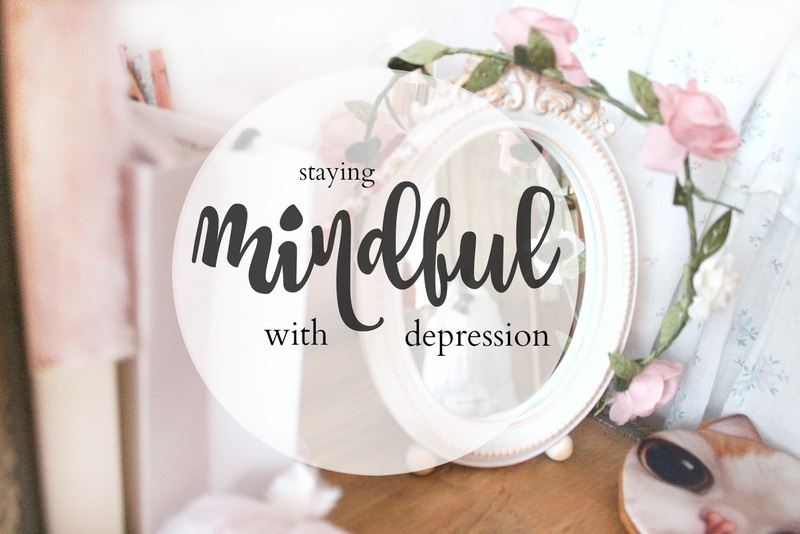 My article contains a few things that help for me and I wanted to approach it in a completely vague way as there are so many levels and kinds of depression, from feeling physically terrible, sleepy, low in mood, feeling bizarre, to feeling completely detached from life. There are countless ways it can manifest but when life starts to feel uncomfortable - whether it is brought on by events or has completely arisen on its own, whether it's something you've always had - I hope my article might help a little bit.
. Understand the difference between physical sensations, thoughts and emotions. There can be so many different physical sensations that go along with depression and anxiety, from a deep gnawing in the pit of your stomach, just needing to sleep, weighed down or just very ill. Often we attach meaning to these symptoms which can add even more emphasis to them, from thoughts like "When will I feel better?" or even "I don't deserve to feel better". By stripping your physical symptoms of their meaning, they quickly become less important.
. Observe your thoughts and feelings and how they make you feel. Take a moment to notice your thoughts from a clear perspective, do not judge them in any way when they arise. Think of your thoughts or feelings like clouds, coming and leaving; they won't stay for long. Observe each one as it comes and goes and look at how you might normally respond to them and give them meaning. Are they really helpful to you - how do they make you feel?
. Stop fighting it. Let it come. Whatever terrible things you feel, let them in. It's completely fine to feel that way. Embrace the windiest, rainiest day, because it's there. The way you might feel is not something to get rid of, it's part of you and completely normal and natural. Give your feelings the warmest welcome, let them stay a while, treat them compassionately, like a wounded bird. Change comes with commotion, let it coexist with who you are. It's okay.
. There is good in everything. Even if the last thing you feel is good, try turning the situation on its head, as difficult as it may seem! I'm so grateful for learning techniques to combat my anxiety because they are so useful to apply to all areas of my life. I'm grateful in a way for the bad, ill days because they make days where I actually feel normal amazing! It's total bliss to me, the idea of feeling 'normal'. My struggles means I can connect and sympathise with people on another level I have never attained before.
. Live simply, be kind. Leave that instagram page alone and keep connecting with strangers in real life. Contributing and spreading kindness is the most constructive thing you can ever do and the most satisfying in fulfilling your human purpose. We have our careers we try to perfect, not to mention our social media profiles, but happiness doesn't require that fame, all those followers or expensive things. Happiness can be found in the smallest of places and definitely without all of those things - I'm sure they got on pretty well in Disney princess times, definitely minus the villains! If you need to rest, or work from home that's okay. Just paying someone a compliment, saying thank you, constructing a little prayer in your head to wish everyone well will help connect you back to your happy roots. It may not be the end all cure, but just making it your mission will give you a kind of purpose you never imagined you'd have. Do you feel bad sometimes? What are your feel-better strategies? This is actually a little survey I'm doing as part of my course of CBT so I thought I would ask you guys! Lots of love! great post ! lovely of you ! These are some really important points to share and I'm sure there will be some that it will really help! Hello dear, I love this post! I've been through difficult and even unmanageable emotions lately, often leading to panic attacks. I can't really explain how horrible they can be if you don't know how to manage them, but I found out that the strategies I've been using to help myself feel better work really well when I have these awful attacks. I try to think that feeling sad is not bad at all, as long as you are not sad all the time, and that you have to be objective when it comes to your emotions, I mean: you have to choose what can make you feel wrong and what shouldn't affect your emotions in a negative way. I agree in most of the things you said. Being a mother sometimes can be exhausting and it can make you feel very tired and sad. I would be so happy if you followed me back, so we can support each other. Thanks. Have a lovely Sunday. I really liked this honest, moving post. Personally I have struggled with social anxiety, panic attacks, general anxiety disorder, and a lot of stress. It's nice to find someone who can relate! Stepping back from the online world and making time for family and loved ones, as well as spending some time outside. But I don't suffer from depression, so it is just when I feel a little worn out. Thank you for sharing these tips, it is very important to show that you aren't alone and I am sure your post will have helped others reading it. I really enjoyed reading this post, thank you for sharing some tips. I find when I'm having a bad bout of sadness I like to treat myself to pamper evenings and colouring books accompanied by a bottle of wine! I hope you're having a better week lovely. This is what I needed to read, thank you for sharing! I have been having these bad days for the last couple of weeks and it just doesn't go away as wherever I turn my thoughts towards to nothing good comes up! I took over a week of online world to try to deal with the problems however it didn't go as planned and now I know that this little world just makes me leave my problems behind at least then I don't have to worry about anything. Thankyou for writing this - I'm sorry you feel this way as well. I understand the feeling but I agree sometimes the bad days make the non bad days feel amazing (if that makes sense)! Great post and thank you for writing about this topic. I like you have good and bad days but your second point is what I find helps me the most - observing my thoughts and feelings to better understand them. Mindfulness helps a lot and like Beckie above I keep a worry diary which helps with anxiety. What a truly wonderful post and article this is . . .